One day you’ll look back and realize that you worried too much about things that don’t really matter. I’ve seen that neither snow, nor rain, nor heat, nor gloom of night stays these couriers from the swift completion of their appointed rounds to Walmart and back. Fortunately they sell Mane ‘n Tail Detangler because I think he’s gonna need it when he dries out. It’s been said that if you choose a job you love you will never have to work a day in your life. But I think that applies more to a job like a motorcycle tester than an Amish farmer. Wendell Berry wrote: “There are only two reasons to farm: because you have to, and because you love to. The ones who choose to farm choose for love.” I wonder if the horses feel that way too? After shoveling off my car this morning it began snowing again when I went out to grab a cup of coffee. I noticed this horse at our local laundromat and stopped to say hello but he did not look happy. He was either furious that winter was back with two more days of snow and ice predicted or he accidentally ate some laundry soap. The owner and her two kids were waiting to leave as I took a few photos and I didn’t ask. So here in Lancaster, P.A. March may go in like a foaming horse but I seriously doubt it will go out like a lamb. I don’t think their legs are strong enough to pull a buggy and three people. I stopped to photograph this Amish farmer getting his field ready for planting and it was such a tender moment that tears came to my eyes. It might have been the near freezing temperature and biting wind, but the scene reminded me of many things. Time passing so quickly, the changing of the seasons, the beauty of spring and the hard work of these farmers. As the smell of horse manure rose into the air, I thought of the show Green Acres, and Oliver deciding that working with his hands was more important than working as a lawyer in the big city. I would say that farm livin’ is the life for me, keep Manhattan just give me that countryside. But I don’t like getting muddy, or working in a field all day, or having obsessive photographers standing there taking my picture while I’m trying to do my job. The horse might know the way but does he know about the coming storm? Depending on who you listen to, we have a winter storm warning with predicted snow, rain, more snow and temperatures dropping to 6 degrees with wind gusts of 30mph. Unless he has a TV like Mister Ed, he probably has no idea and will get a good nights sleep then get up in the morning and go wherever he has to go. Unlike people, he doesn’t have the capacity to worry about a future which doesn’t exist. In my next life I’d like to come back as a horse despite Ernest Becker’s view of them as “living in a world without time, pulsating, as it were, in a state of dumb being.” Not an Amish plow horse in Pennsylvania but a wild horse living on the beach somewhere warm, maybe Utah. Ain’t never been there, they tell me it’s nice. 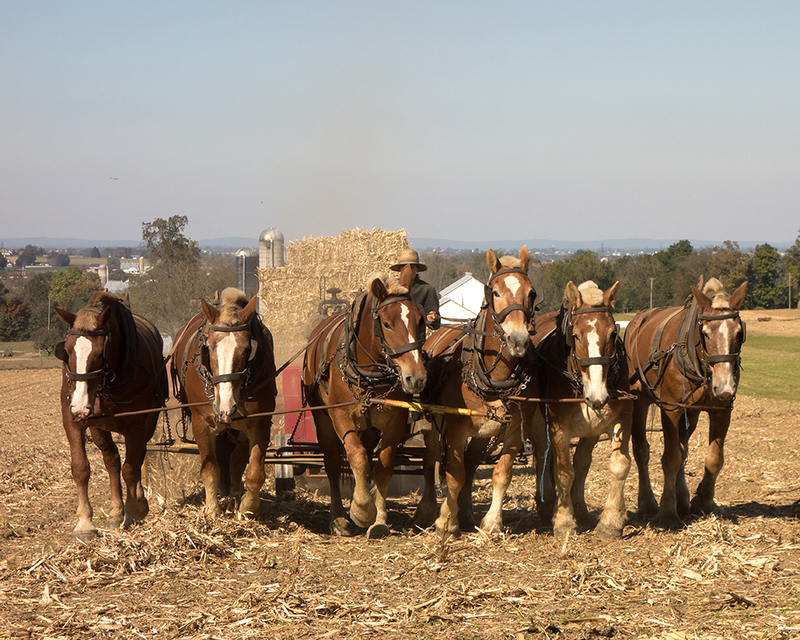 Note: Out of respect to the Amish I instructed one of the horses to block the farmers face and he did it perfectly. Click on the image to see it larger.